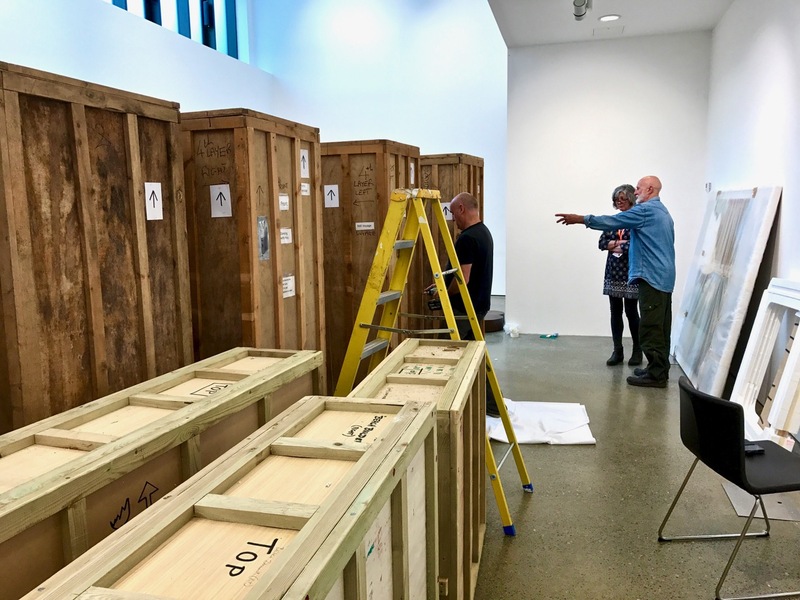 I was allowed behind the scenes to experience the exhibition of Cornish artists – West meets West – being unpacked and arranged. It’s quite a process. All the works are large scale and were packaged for protection during the journey across sea and land from Cornwall. 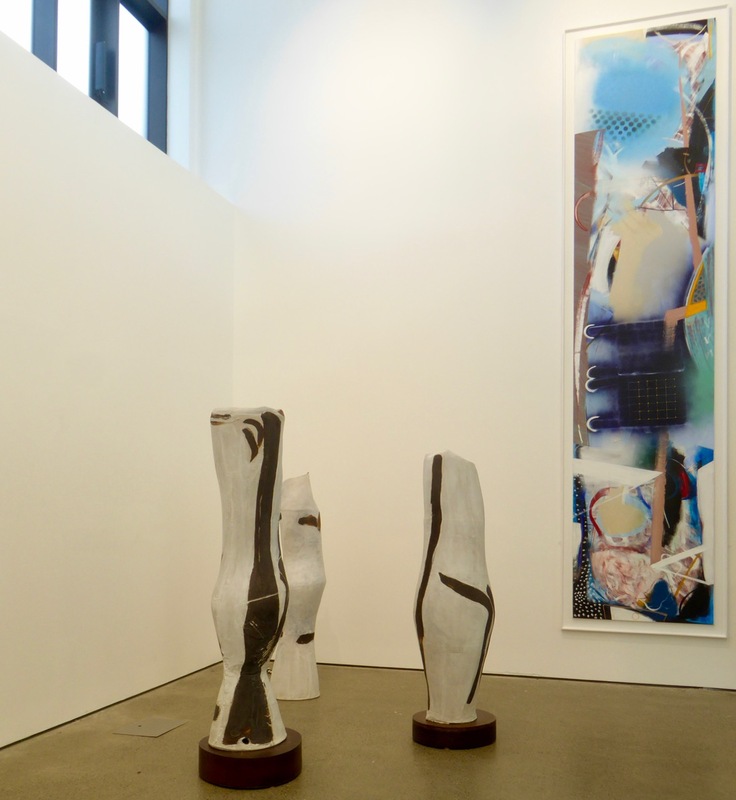 For a while Uillinn’s spacious ground floor gallery seemed overwhelmed, and it was hard to envisage how the various elements (two dozen substantial pieces) would come together in harmony with each other. 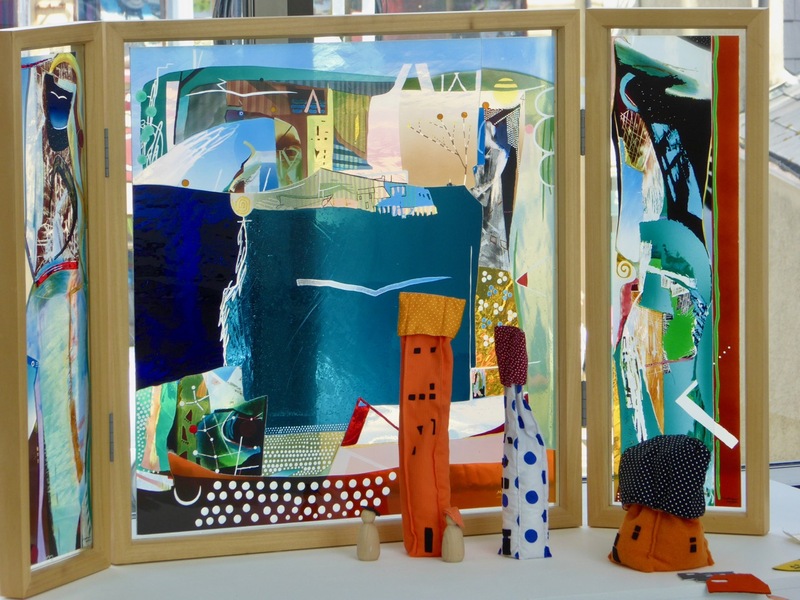 The work comprises paintings, a tapestry and a laminated glass piece by Matthew Lanyon; relief sculptures by Philip Booth, and ceramic sculptures by Tony Lattimer. Many are heavy, and they all have to be handled safely and carefully (white gloves only!). 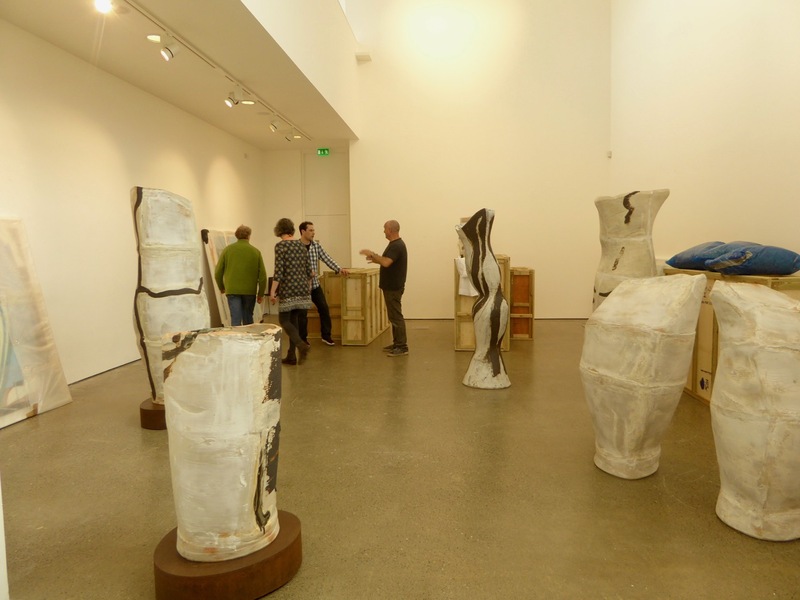 The exhibition runs over Uillinn’s two galleries, and there was a bit of ‘trial and error’ involved in deciding how the dynamics of the pieces would interact. In fact, I believe all the exhibits are strong enough to stand alone but also relate to others when, inevitably, the viewer moves around and experiences the various juxtapositions. 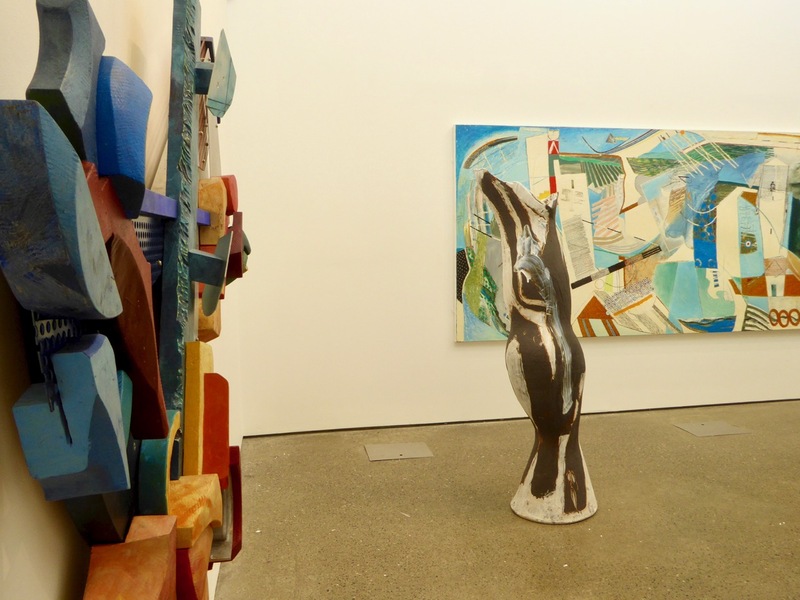 There are a few ‘firsts’ in West meets West – it’s the first time that Cornish artists have visited Uillinn in a group show; this is, hopefully, a first step in a collaborative venture which will see the works of contemporary artists crossing between Cork’s west coast and Cornwall’s westernmost peninsula. Both communities have strong historic links and both have supported creative centres for arts and crafts going back a century and more – and still do. It’s also the first time that some of these works have been publicly shown. Every exhibition has a formal opening. West meets West was opened by the Mayor of Cork County, Seamus McGrath, who spoke of the importance of maintaining links across the sea, particularly in these divisive times of ‘Brexit’. 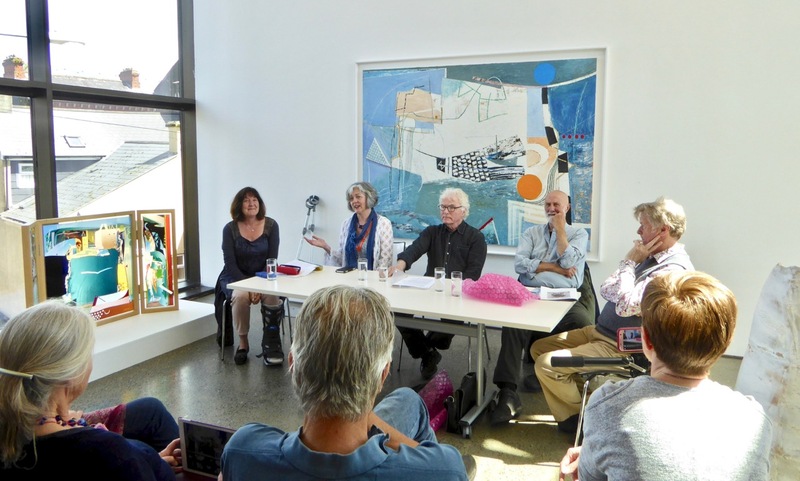 On the following day, there was a very well attended panel discussion where the artists were given free rein to relate their experiences in conceiving and creating their work: Matthew’s widow, Judith, represented him and gave us some wonderful insights into why the Lanyon works were made and how they might be interpreted. 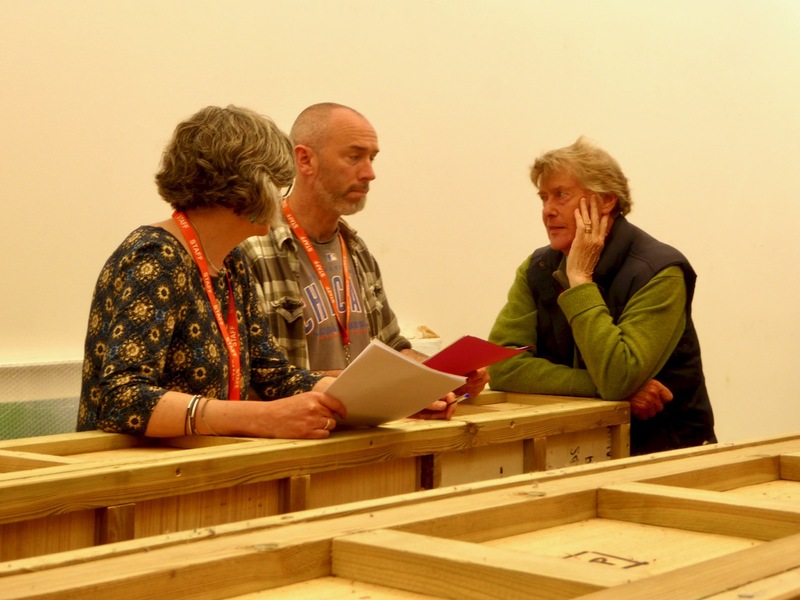 Philip Booth talked us through the processes involved in designing and building his complex constructions, while Tony Lattimer effusively expressed his working methodology. It has been a great achievement to get this dynamic, vibrant and colourful exhibition into the galleries at Uillinn. Please don’t miss it – it runs until 8 July – and look out for some extra events: I will be giving a talk following a guided gallery tour on Saturday next, 10 June, commencing at noon. 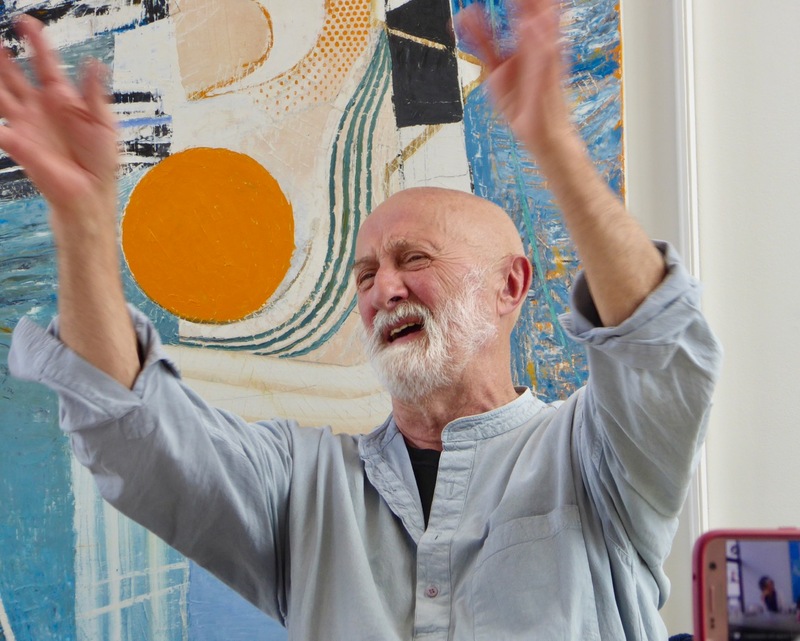 Tony will be giving a ‘walk and talk’ on his work at 3pm this Thursday, 8 June – keep an eye on the Arts Centre website or Facebook. We are also planning a coach tour of sites in West Cork which have Cornish connections (there are many!). Please ask at the gallery if interested. 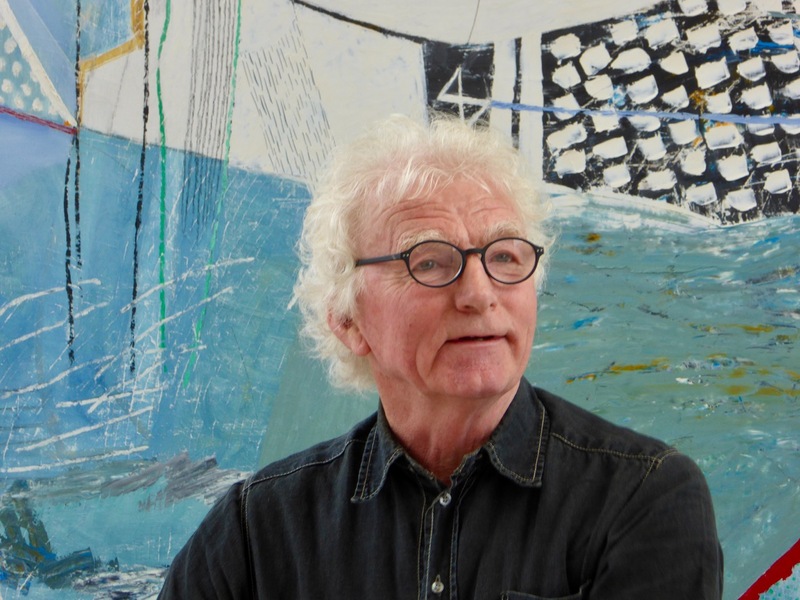 I have been working hard with Uillinn – West Cork Arts Centre‘s fantastic new gallery in Skibbereen – to bring over an exhibition of the work of contemporary Cornish artists, which opens in June. West meets West will be the launch of a continuing programme which sees the art and culture of Cork and Cornwall being shared, to the mutual benefit of all working artists and art lovers – and to residents and visitors. Why Cornwall and Cork? And, particularly, why these westernmost peninsulas of Ireland and England? Well, as you may have noticed from past posts on this Journal, historic links between the two geographical areas go back a very long way. Starting between three and four thousand years ago copper was mined on Mount Gabriel and was mixed with tin from Cornwall to produce a revolutionary new metal – Bronze. This material was hard enough to make tools and weapons – therefore a practical commodity: also it does not rust. It has, too, been used to make bells for centuries, so its properties include sonority. In fact the word bronze probably originates from the Medieval Latin bronzium, in modern Italian bronzo, meaning ‘bell metal’. Regardless of all this, the important thing we know is that relations between the west of England and the west of Ireland were well enough advanced to set up regular trading between the two outposts in those far-off days. In a recent post I alluded to the incredible debt that Cornwall owes to us in West Cork because we gave them their patron saint – Saint Piran. The fact that the gift wasn’t intentional shouldn’t delay us too long: we tied Cape Clear’s Saint (whose Irish name was Ciarán) to a millstone and threw him over a cliff. 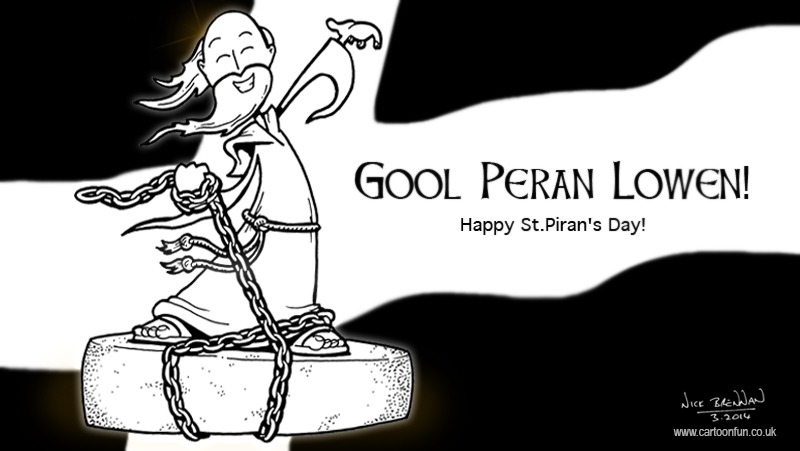 Instead of meeting his doom he miraculously surfed the millstone across to the Cornish coast, where his landing place – Perranzabuloe – is named after him, and where he is royally celebrated on March 5th every year, with all the zeal that we show to our own St Patrick! Apart from metal mining and saints, another important connection is shared fishing grounds. From medieval times onwards (and perhaps before) the Cornish fishing fleets put out from Mousehole and Newlyn to follow the pilchard and herring shoals across to Roaringwater Bay. 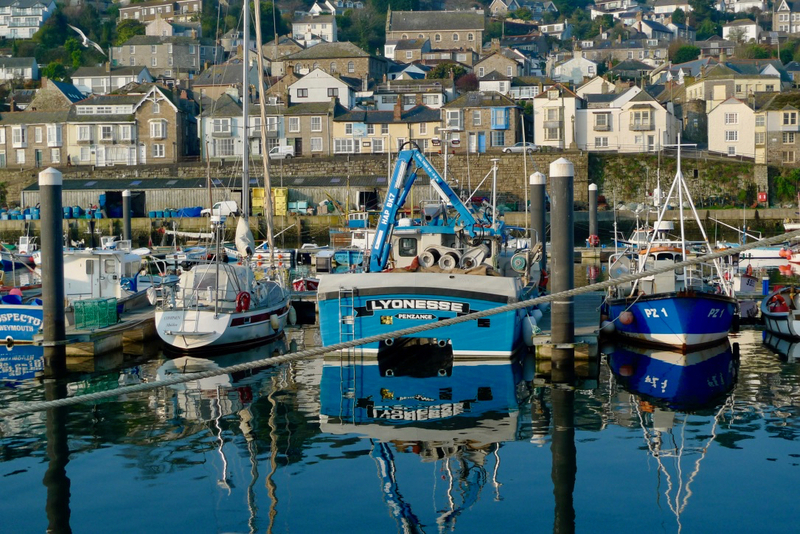 This is really where art comes into our story, as it was the way of life of some of the Cornish fishing communities that attracted artists to that western County of England in the late nineteenth century, once the arrival of the Great Western Railway in Penzance had established the direct connection with London. 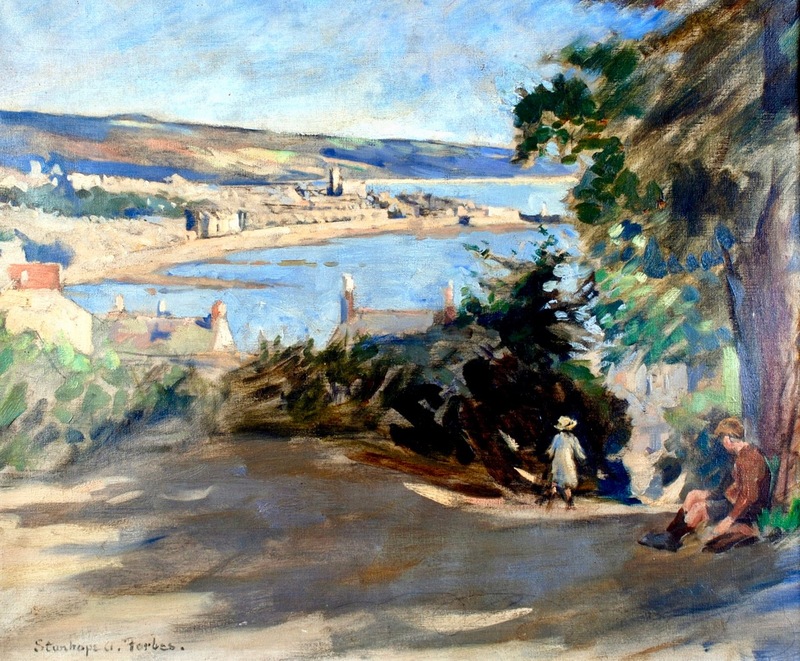 Newlyn was an early focus, and a young man from Dublin, Stanhope Alexander Forbes, an up and coming young painter in the plein air tradition, made his home there in 1884 and stayed for life. Forbes found in Cornwall a true ‘rural idyll’: an unspoiled countryside where life was simply lived, and a rugged coastline with a magical quality of light. Known as the ‘Father of the Newlyn School’, he gathered around him like-minded artists who recorded (and perhaps romantically idealised) the way of life of the communities there, and that special quality of the light, in canvasses which are highly admired and respected today. I made my home in Cornwall for a number of years, before I decided that I hadn’t come far enough to the west, and followed the pilchards and herring myself to Roaringwater Bay, where I now look down on them from my eyrie in Nead an Iolair (although the shoals are today much diminished). During my years in Cornwall I came to know and respect the stories of the artists from Victorian years up to the present day. The ‘Newlyn School’ which Forbes represented was only one piece of the jigsaw there: we will explore others later. 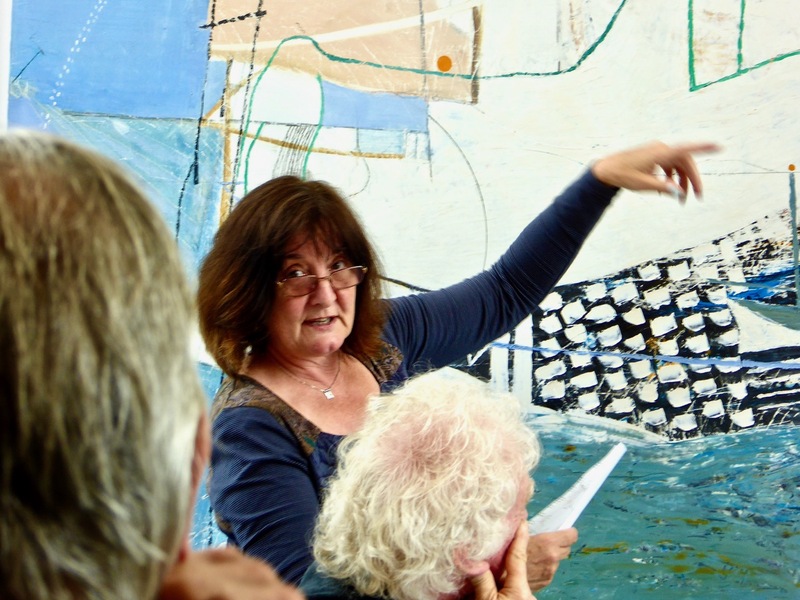 Art is probably Cornwall’s biggest asset. 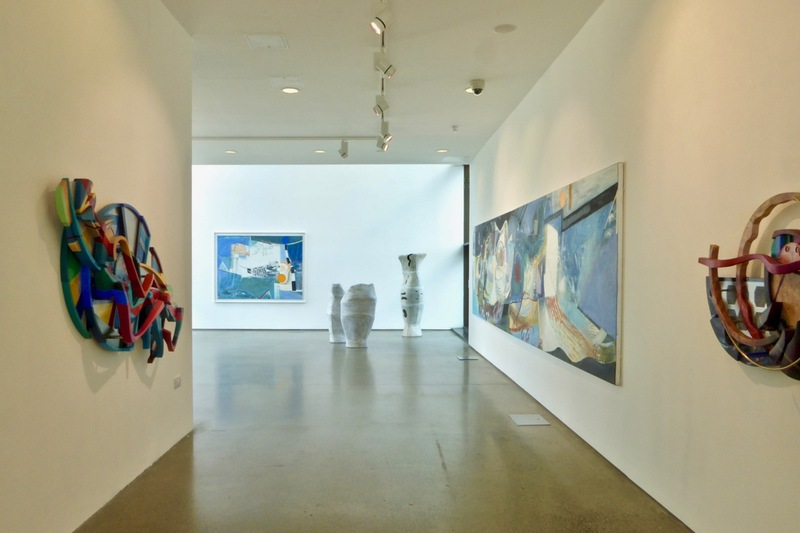 Ever since the opening of the Tate Gallery in St Ives – established there because of that town’s historic links with artists and craftspeople of international repute – ‘art tourism’ has grown to become a major year-round driver of the local economy. Cornwall is home to a number of artists renowned today in the British Isles. I got to know many of them when I lived in Newlyn. 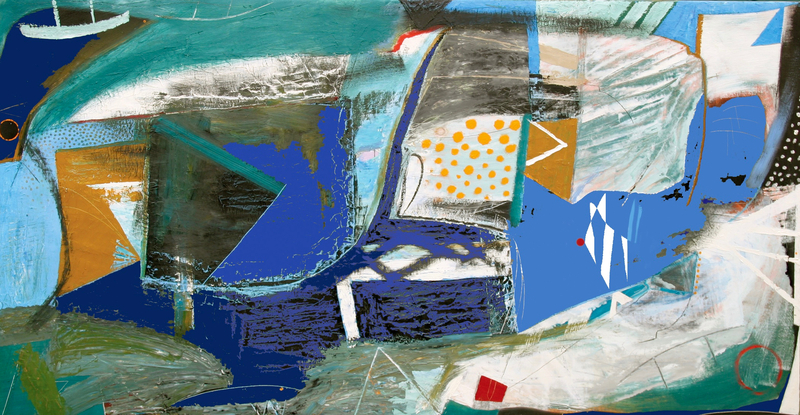 Three of them will be exhibiting in Uillinn from 3 June to 8 July this year: Philip Booth, Matthew Lanyon and Tony Lattimer. 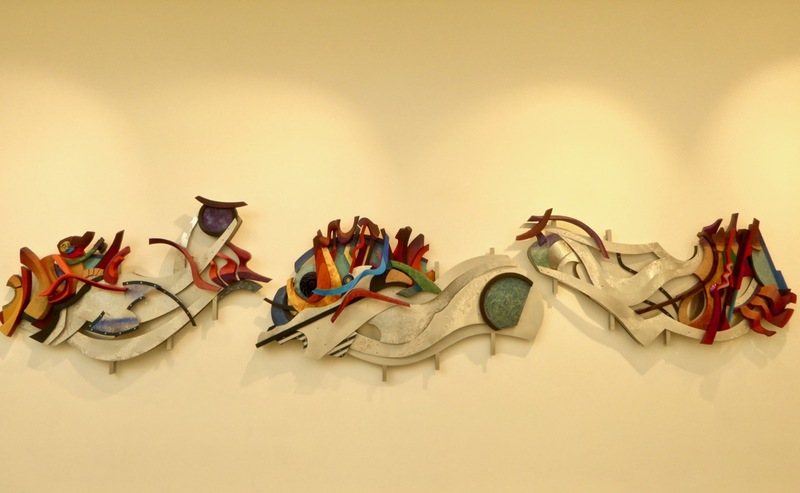 Their work is large scale, stimulating and mutually complementary: constructions, canvasses and ceramic sculptures. Please make a note of the dates now: this exhibition is important for West Cork and for Cornwall. Please don’t miss it!